Breakfast for dinner. Brinner. Dinfast. Definitely a favorite in our house. The recipe is from the Betty Crocker’s Diabetes Cookbook. I made a few small substitutions, noted below. Heat oven to 425 degrees. Generously grease bottom and sides of a 13×9 baking dish. 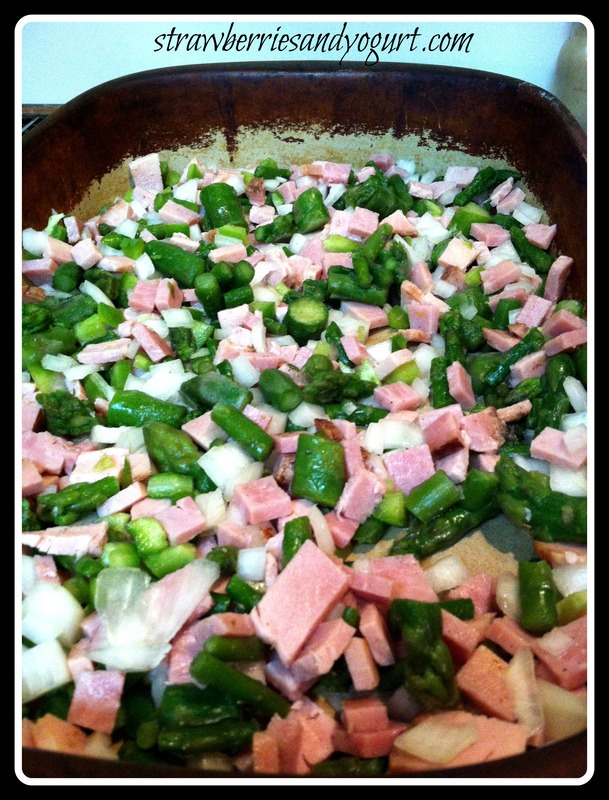 Sprinkle ham, onion, bell pepper and asparagus in baking dish. – I used my pampered chef pan (no greasing). I also tossed the ham and veggies together in a bowl before putting them in the baking dish. Beat eggs, milk, flour, parm cheese, salt, pepper and tarragon with a fork or wire whisk in medium bowl until smooth; pour over ham mixture. Bake uncovered about 20 min, or until a knife inserted comes out clean. Sprinkle with cheddar cheese. Bake 3 to 5 minutes or until cheese is melted. Let stand 5 minutes before cutting. 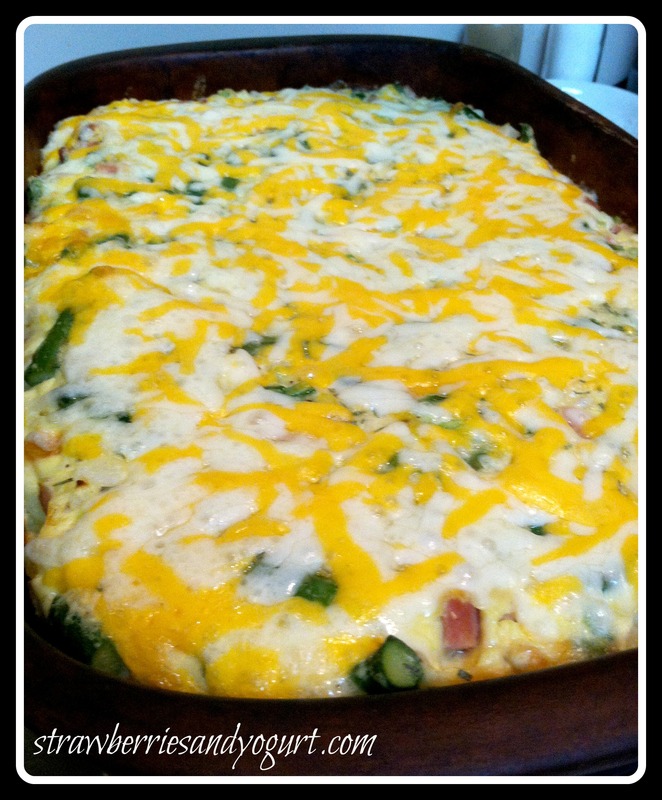 This is a easy and delish casserole. 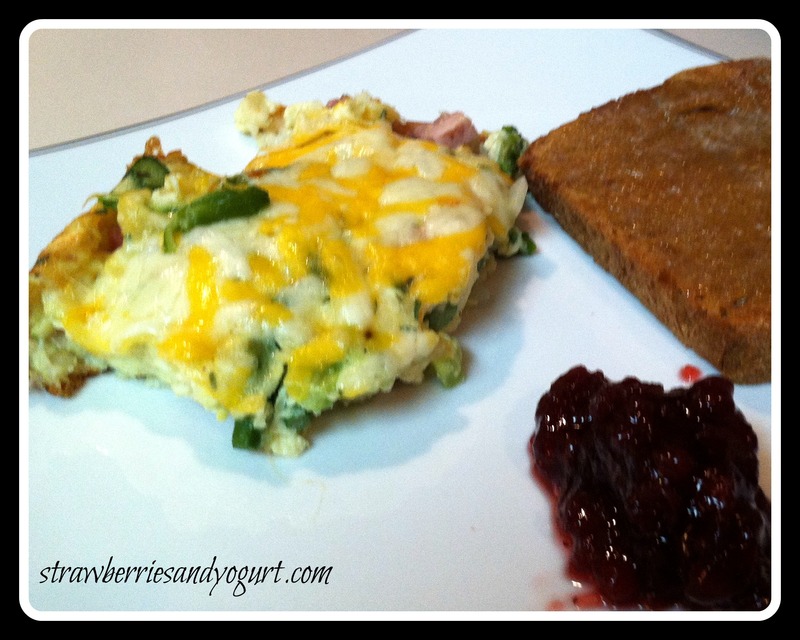 Both husband and I liked this one and it’s a great use for leftover ham (from Christmas or Easter). A friend of mine blogged about this recipe early in 2012, and I have made it probably ten times in the last year. It’s that good. Put all ingredients in a large stock pot and simmer, lid askew for 4 hours. Strain the broth, discarding the ham and vegetables. At this point you can make the soup, or you can refrigerate or freeze the stock to use later. I like to make the broth the day before I make the soup. I will also strain the fat off the top of the broth before using in the soup. Melt the butter in a large pot over medium heat. Add the celery, onions and carrots and cook for about 5 minutes, stirring occasionally. Add the flour and cook, stirring for 3 minutes. Add the stock and split peas. Simmer with lid askew for 45 minutes. Season to taste with salt and pepper. Use an immersion blender in the pot to blend the soup. – Alternatively, put some of the soup in a blender. Fill the blender only half full and hold the lid on securely with a pot holder. Serve with sauteed ham or croutons as a garnish. This is another favorite in our house and is perfect on a cold winter evening. Add a little diced ham to your bowl and a warm roll on the side, nothing could be better.